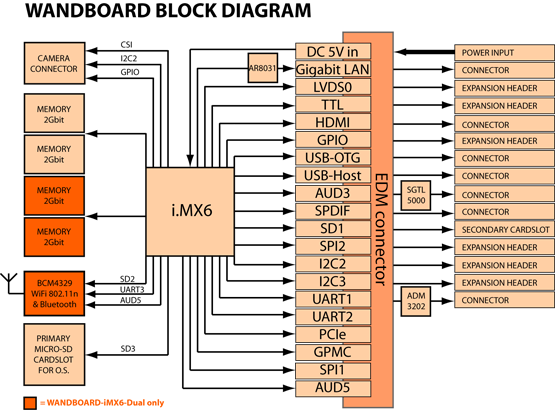 The Wandboard is a ultra low power complete computer with high performance multimedia capabilities based around the Freescale i.MX6 Cortex-A9 processor. It is offered with a dazzling 1Ghz processor, HDMI display interface and gigabit ethernet. The dualcore version of the Wandboard (The Wandboard DUAL) not only features 1GB of memory but also has onboard Wi-Fi and Bluetooth. The spirit that drove the development was the fact that many of the development boards we see today are fun to play with but there is no flexibility in place to design a product beyond the initial stage. With the Wandboard we try to overcome this by choosing a System-on-Module that works with an easy to design few layer baseboard that everyone can design and make with beginning engineering knowledge. The Wandboard is supported by the Wandboard community, more information is available on http://www.wandboard.org/.